It’s summer time and that means parties and barbecues and…fruit on the grill? Absolutely. I have heard of grilling bananas before (which is amazing), so I thought maybe trying a few other fruits on kabob stick would be interesting. And especially interesting paired with a little lavender vanilla ice cream. Ok, let’s back up here. Yes, I’m talking about lavender, the purple, good-smelling flower that you normally think of as a scent for body lotion or home fragrances. Turns out, lavender has culinary uses as well. Heard of the spice blend herbs de provence? Lavender is in it! Every time I buy a new container of it, I always add extra lavender. If you like the way lavender smells, you’ll like the way it tastes because it tastes exactly the same way. Tonight, I used my stash I bought at Spice and Tea Exchange. Lavender has many uses such as calming the nerves, soothing irritated skin, and reducing nausea. Personally, I keep a little satchet of dried lavender flowers that I got at a beautiful organic lavender farm in rural Pennsylvania by my bedside. The scent just melts away stress and helps me get to sleep easier and more peacefully. And of course, I like to eat it too. I chose apricots, peaches and pineapples because they’re fairly firm when not-too-ripe. Once the heat chars the fruit and caramelizes the natural sugars, get ready for a sweet treat. Soak wooden kabob sticks in water before grilling to keep them from burning (clearly, I didn’t do this, as you can see in the photos). 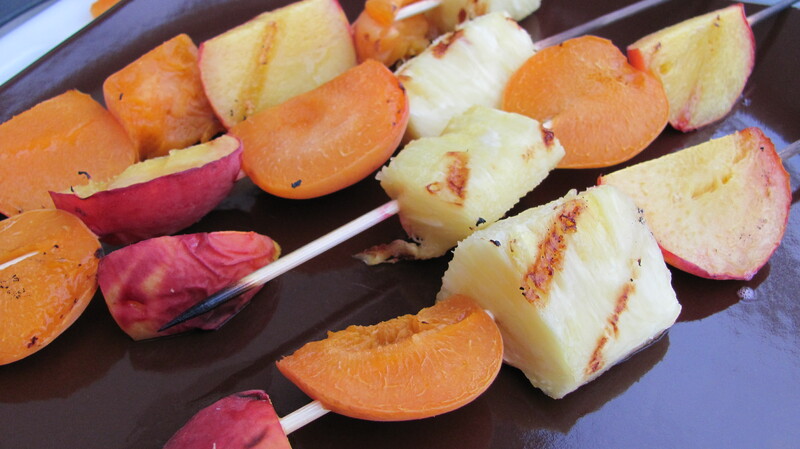 Place 4-5 pieces of fruit on each kabob stick and grill for about 10 minutes on medium heat (400-500°) until fruit has slight grill marks on both sides. Do not overcook or you’ll have a mushy mess dripping through your grill. I took the easy route here. I just bought a pint of So Delicious coconut-based dairy-free and soy-free Vanilla Bean frozen dessert, let it melt a little, stirred in about 2 teaspoons of dried organic culinary lavender flowers, then put it back in the freezer. Voila. 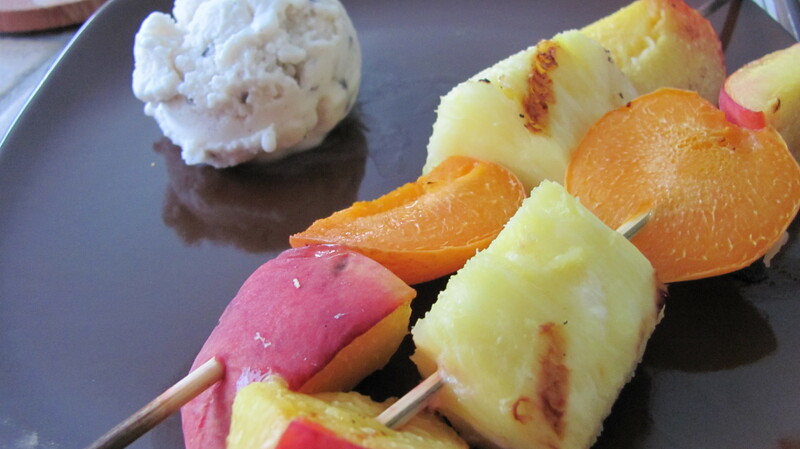 Amazing and fast lavender vanilla ice cream that goes awesome with some grilled fruit.